Army Specialist Carroll Moulden joined the military in 2005 out of Annapolis, Maryland because he wanted to do something meaningful with his life and wanted to support his family. He said his experience in the Army made him a better man for his family, and his service overseas made him appreciate his own life even more. Specialist Moulden was injured in 2007 when his team encountered an explosively formed penetrator (EFP), which caused at least one casualty. Shortly after that, he experienced internal bleeding and had to be flown back to camp for testing. The years of war in Afghanistan and Iraq have brought PTSD among military personnel to the attention of the American people like never before. Blast waves from explosions rattle the brain and can cause traumatic brain injuries which are often linked to PTSD. Most PTSD sufferers repeatedly relive the trauma in their thoughts during the day and in nightmares when they sleep. While the condition varies from person to person, more and more studies have linked PTSD with chronic depression and suicidal ideation. In addition to severe PTSD, Specialist Moulden suffers from recurring migraines, knee pain, sleep apnea, and tinnitus. 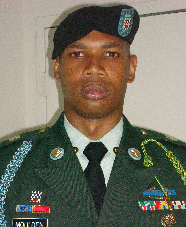 For his service to his country, Specialist Moulden has been awarded the Army Commendation Medal, National Defense Service Medal, Global War On Terrorism Service Medal, Iraq Campaign Medal Campaign Star, Army Service Ribbon, Overseas Service Ribbon and the Combat Infantryman Badge. Specialist Moulden, his wife Kijafa and their five children will receive a mortgage-free home in Greensboro, North Carolina.